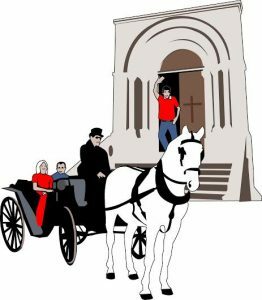 Augusta, Georgia – On Sunday, October 25, 2015 churches in downtown Augusta will once again open their doors for visitors to take a walk through their churches and through history. The participating churches are all listed in the National Register of Historic Places and represent many firsts for the community as well as their denominations. While each church is proud of its individual history and historical buildings, the goal of the tour is to highlight the impact these institutions have had on Augusta for more than 200 years. “We decided to present this Encore tour because of the great feedback we received from visitors last fall,” said Rachel Gregory of Sacred Heart, head of this year’s planning committee. 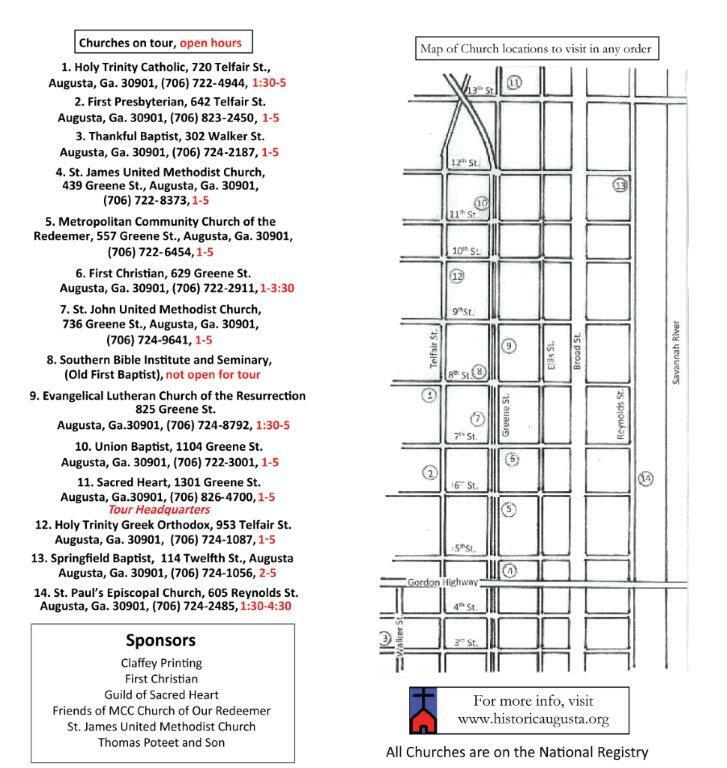 The tour is self-guided and tour maps can be picked up at any of the participating churches on the day of the tour (see below for map). The tour times are from 1:00pm – 5:00pm. See the tour guide for specific times for each church. Participating churches are Holy Trinity Catholic Church, First Presbyterian Church, Thankful Baptist Church, St. James United Methodist Church, Metropolitan Community Church of Our Redeemer, First Christian Church, St. John United Methodist Church, Evangelical Lutheran Church of the Resurrection, Union Baptist Church, Sacred Heart Cultural Center, Holy Trinity Greek Orthodox, St. Paul’s Church and Springfield Baptist Church. The Southern Bible Institute and Seminary (old First Baptist) is supporting the tour and highlighted on the tour map, but the building will not be open to the public. 6. First Christian Church# 629 Greene St. The First Christian Church congregation was organized in 1835 in the home of Mr. and Mrs. Edward Campbell by Dr. Daniel Hook, a physician and later mayor of Augusta. In 1836, the great Augustaphilanthropist, Mrs. Emily Tubman, joined the church and proved to be a driving force in its development, just as she influenced the city. In 1842, Mrs. Tubman financed the construction of a frame church on the 700 block of Reynolds Street. It was used until the present church was completed, then served as a women’s high school named for Mrs. Tubman. The present church and all surrounding structures were built between 1874-76, again with Mrs. Tubman‘s generosity. 8. Southern Bible Institute and Seminary, (Old First Baptist)* 802 Greene St. (not open for the tour) Designed in 1902 by architect William F. Denny, this building is a fine example of the Beaux-Arts style and features many characteristics indicative of the style, including decorative garlands, floral patterns, and symmetrical façade. The present building is notable for its cross-gable plan, its copper dome, its monumental Corinthian columns and its tremendous arched windows. The congregation moved to West Augusta in 1975. This building has subsequently been used for fledgling Southern Baptist congregations and since 2003 has been used by the Southern Bible Institute and Seminary. The Baptist Praying Society was established in Augusta in 1817, and completed their first building on this site in 1821 with John Lund as their architect; it was in that building the Southern Baptist Convention was founded in 1845, eventually becoming the largest Protestant denomination in the world. 10. Union Baptist Church# 1104 Greene St. Union Baptist Church was founded in 1878 by former members of the Springfield congregation. In 1883 they acquired a building that had been built as a white Presbyterian church at the southwest corner of 11th and Greene Streets, but had more recently been used by a black Methodist congregation. In 1887 the Union congregation hired the Augusta architectural firm of MacMurphey and Story to enlarge and remodel the former building, which resulted in the outstanding Carpenter Gothic edifice that remains today, completely intact. Restoration of the building has been ongoing through a partnership between the Union Baptist congregation and Historic Augusta, Inc.
13. Springfield Baptist Church* 114 Twelfth St. Organized in 1787 by Jesse Peters, the Springfield Baptist Church is the oldest independent African-American Church in the nation in continuous existence. This church helped bridge the transition between slavery and free citizenship and has stood as a focus for black community life. The first building, which was erected in 1801 by Augusta’s first Methodist Society, was moved from Greene St. to Reynolds St. in 1844 to become the home of the Springfield Baptist Church. That original structure was then moved to the rear of the lot when the new brick church was built in 1897. It remains in use as their fellowship hall and is a major landmark from the early free-black community of Springfield. In 1867, Morehouse College, the nation’s only all-male, historically black undergraduate institution, was founded in the basement of Springfield Baptist Church as Augusta Institute by William Jefferson White, as requested by Rev. Richard C. Coulter and Rev. Edmund Turney, while Henry Watts was serving as pastor. The school moved to Atlanta in 1879 and was renamed Morehouse College in 1913. 14. St. Paul’s Church* 605 Reynolds St. St. Paul’s began as a small chapel beside Fort Augusta in 1749, a parish of the Church of England. The first two church buildings were damaged or destroyed in the French and Indian and Revolutionary Wars. After being incorporated in 1818 as an Episcopal Church, a fourth building was constructed in 1820. It later burned in the Great Augusta Fire of 1916, but was almost identical to the present building. Augusta architect Henry Wendell designed the fifth building on the site, emulating the exterior of the 1820 church, but completing the interior in the Georgian style. Memorial stained glass windows were added as late as the 1960s. The chapel and parish hall were remodeled in the 1970s, and the Children’s Ministries Center was completed in 2000. The River Room and Berlin Room were finished in 2008, and today serve many community events unrelated to the church. The cemetery holds many famous local and national figures. www.saintpauls.org.